Tell someone you’re going to Amsterdam and you’ll likely receive a knowing smirk in return. “Oh, Amsterdam, eh? I hear the coffeeshops are great…” Wink wink, smirk smirk. As if permissive pot laws are the only reason you might visit this stunning, unique, and culturally significant city. As a matter of fact, said laws didn’t play much of a role in my decision to book a nine-day trip to the city. * My travel bucket list includes pretty much the entire world, so when I saw a $381 round-trip flight to Amsterdam pop up back in February, I jumped on it. Amsterdam would be my first solo trip. I couldn’t wait to spend hours meandering through some of the best museums in the world, all on my own, and eating amazing vegan food, all on my own. I booked accommodations for Amsterdam and Rotterdam in Holland, and then two nights in Bruges, Belgium. I’d get to knock two new countries off my list, and I’d see them all on my own time. And then Luna died, just two days before I was set to leave. And all my excitement — for seeing a new city, for traveling alone — vanished. I considered canceling. I still wanted to go, but I didn’t know whether I could — or would — enjoy myself. I asked for guidance in one of my favorite female travel groups on Facebook, and nearly everyone said the same thing: If you at all think you’ll regret staying home, just go instead. But be kind to yourself and don’t force yourself to sightsee more than you want. Just do what makes you happy. Steven — amazing, supportive Steven — agreed. He said he’d be OK staying home alone with Moria while I was gone. So I went. And as I said on Sunday, I’m so glad I did. So, so glad. Yes, there were semi-public tears and moments when grief hit me unexpectedly. (Being away on the one-week anniversary of her death was particularly hard.) But that was OK. I let it happen. With time, though, my appetite returned, and I’m happy to say that I finally got to enjoy some pretty amazing vegan food in Amsterdam. Read on for that, and for some additional tips on finding vegan options in Amsterdam. Enjoy! Located a bit off the beaten path in Amsterdam Oost (East), Beter & Leuk is a sweet little cafe with plenty of vegan options. It was a bit of a hike from my hotel, and of course I chose to make the trek on a drizzly, grey morning, but it made my visit all the better: I waited out the rain, enjoying a matcha almond milk latte and a scone while people-watching and reading. #bliss. I loved CT Coffee & Coconuts the minute I stepped inside. Housed in an old theater in the cute de Pijp neighborhood, the cafe is bright, light, and surprisingly spacious — there are three levels, with all sorts of seating options and arrangements. The vibe is pretty unique: hipster trendy (think exposed brick and white accents) meets laid-back tropical island style. And it works, somehow. I enjoyed this place so much I came back for breakfast on my very last morning, just before heading to the airport. Although CT Coffee & Coconuts is actually open all day from 8 am to 11 pm, I only ate breakfasts there — but I have no regrets. Both of my choices were phenomenal. I opted for the overnight buckwheat porridge on my first visit, which features buckwheat blended with coconut water and banana and topped with fresh fruit, almonds, and an incredible mango-basil coulis. I need to recreate this meal; the flavors were perfection and I loved the toasty, nutty blended buckwheat. On my second visit, I chose the green coconut bowl, which incorporates buckwheat in another form: the cafe’s signature “buckini,” a lightly sweetened buckwheat-based granola. Fresh fruit and a generous helping of buckini top off a fabulous mango, passion fruit, spinach, avocado, and coconut milk smoothie — a perfect mix of textures and flavors that also just looks really darn pretty. I also tried two coffee drinks. The first, an oat milk latte, was fine. But the second, the “coconut coffee,” was quite honestly the best cold coffee beverage I’ve had in recent memory — and it’s disarmingly simple! Just a double espresso shot blended with coconut milk, agave, and ice. The proportions must be magic or something, because this was heavenly. Another one to recreate! One of Amsterdam’s very first vegetarian restaurants, De Bolhoed definitely has that signature old-school veg vibe. From the physical menus (printed in Papyrus on paper gone soft with age) to the menu items (somewhat uninspired, but also exactly what you’d expect to find in an old-school vegetarian restaurant) to the decor (lots of color and local art), this place reminds me of so many other similar vegetarian joints around the world. It also has a very minimal online presence and is cash-only, so be prepared for that. This trendy, hipster-friendly all-vegan eatery in Oud-West (named after and visually inspired by New York City’s meatpacking district) receives rave reviews from eaters of all persuasions, and for good reason. Meatless District offers innovative, exciting takes on veg-centric dishes alongside more familiar options. Case in point: The meals I enjoyed on my two dinner visits to MD. The first — a cauliflower steak — falls squarely in the “innovative takes” category. This was a massive piece of cauliflower with a spicy marinade and glaze, served with roasted baby potatoes, roasted red onion, coconut bacon, and a little salad of cherry tomatoes and basil. I was glad my appetite had returned by this point, because it was a LOT of food! But so, so good. The cauliflower was tender and juicy, marinated to perfection and perfectly complemented by the crunchy coconut bacon bits. That little side salad of tomatoes and basil was a lovely fresh accompaniment, too. Mmm. I enjoyed this alongside a glass of a white wine and finished up with a steaming mug of fresh mint tea. So, so good. 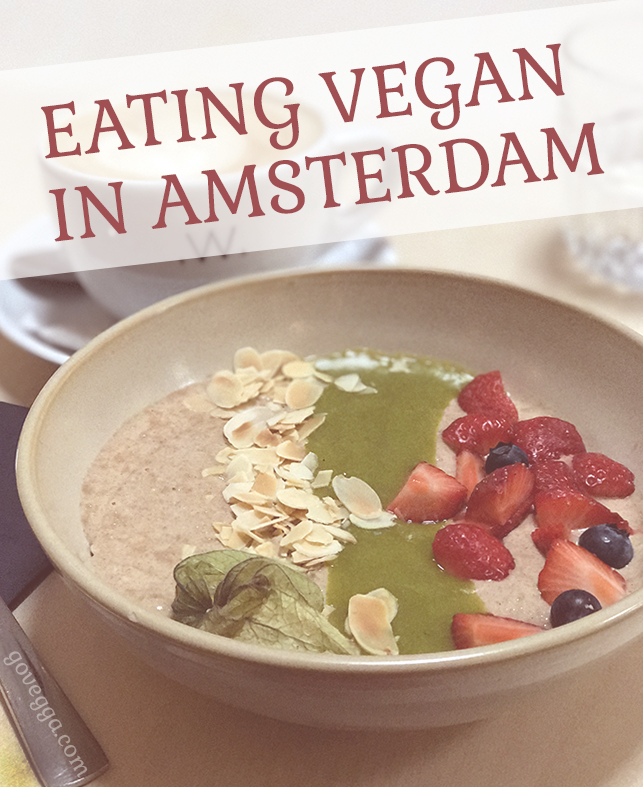 It’s always helpful look up a few vegan-friendly chain restaurants when you’re heading to a new city, and SLA fits perfectly into this category with 10 locations sprinkled around Amsterdam. SLA offers a plant-forward take on quick, healthy, filling salads, although they do serve a few meaty options. You can either build your own massive salad or choose from the menu, which changes seasonally. And because everything is clearly labeled as vegan or not, you don’t have to worry about potential minefields (salad dressing, I’m looking at you!). SLA was actually my first stop for food on the Saturday I arrived in Amsterdam. I wasn’t particularly hungry (see above), but I’d been traveling for 14 or so hours without a real meal, and I knew I should eat. Nothing heavy or complex appealed, so I opted for the relatively simple green bowl (shown above right). With lentils, quinoa, broccoli, zucchini, edamame, avocado, parsley, pepitas, and sunflower seeds, this is a bowl that’s jam-packed with healthy (and tonally matching!) ingredients. The dressing — a blend of apple cider vinegar, olive oil, spirulina, basil, and lemon — sounded promising, but unfortunately it was rather bland. I actually wanted more, and I’m usually a light-dressing-only gal. Still, this was a perfect meal for a stomach that wanted to refuel itself with minimal fuss. My only other complaint was that the avocado felt a bit under-ripe, but avocados are notoriously difficult to evaluate! I hit up SLA again on my second to last day in Amsterdam, grateful for its convenient locations and friendly opening hours. By this point, my stomach troubles had dissipated, so I opted for the more flavorful vegan sushi bowl, which features raw spinach, red rice, edamame, tamari tempeh, pickled kohlrabi, nori, and sesame seeds. This dressing — allegedly a blend of tamari, raspberries, soy yogurt, ginger, sesame oil, and red pepper — was certainly more present than the green bowl’s dressing, but it tasted more vinegary than it had a right to be based on its ingredients. Still, this was another tasty bowl, and so filling that I almost couldn’t finish it! One downfall of SLA’s massively filling mains is that they leave no room for dessert! I’m now kicking myself for not grabbing a slice of raw strawberry and vanilla vegan cheesecake to go, but the storing-and-eating-later logistics were tricky. Next time! Places like Vegabond make my heart happy. This tiny all-vegan shop and cafe packs quite a punch into its small space: You can pick up all sorts of vegan food products (including imports! ), household objects, and even clothing while you wait for a delicious vegan snack, coffee beverage, or dessert to be prepared. It’s also super close to the Anne Frank House and Westerkerk — a convenient stopping point in the middle of a busy day of sightseeing. On my first foray to Vegabond, I picked up a quick to-go lunch and munched it while sitting on a sunny bench by one of the canals. Bliss! I’d ordered an open-faced sandwich, which featured arugula, cherry tomatoes, cashew cheese, and olive oil on a gorgeous thick slice of spelt bread. Simple, but perfect for savoring while sitting in the sun. I returned to Vegabond the very next day for another snack. This, however, was a less sunny day (darn you, fickle weather of Holland), and I opted to enjoy my tofu sausage roll and espresso (odd combo, I know) while sitting on one of Vegabond’s cozy couches, safely protected from the drizzle and the cold. That tofu roll was heavenly: spicy chunks of “sausage” ensconced in a flaky pastry. I almost went back for a second roll! 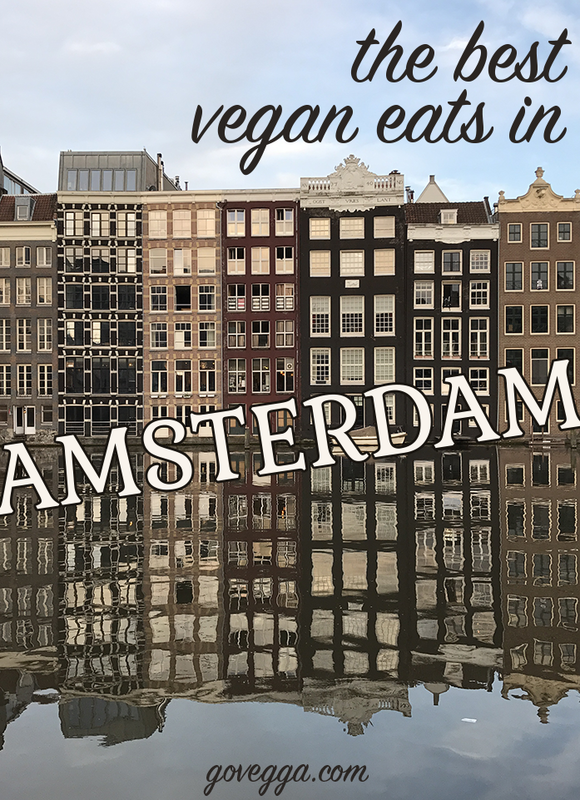 There are plenty of places to eat vegan in Amsterdam, and of course I didn’t try them all. Here are a few that were on my list but never made the final cut. Betty’s Restaurant: High-end vegetarian restaurant with a different three-course meal every day. Requires reservations; let them know you’re vegan ahead of time. Deshima Lunchroom: Macrobiotic, vegan, and organic lunch counter. Restaurant Golden Temple: Vegetarian restaurant specializing in Indian food, but with lots of other influences on its cuisine. Many vegan options marked on the menu. Vegan Junk Food Bar: Vegan restaurant specializing in fried food, including Dutch specialties such as bitterballen. Like many European countries, Holland relies heavily on chip+PIN credit cards. Most eateries accepted my chip-only card; I just had to sign when using it. Some places don’t accept cash at all, including SLA (although I did see the cashier make an exception for an older man who didn’t seem to speak Dutch or English and couldn’t quite understand). Always check before you go! There are a few Le Pain Quotidien locations around Amsterdam, including a few on the way to Amsterdam Centraal. I stopped on the way to the station one morning and picked up their vegan blueberry muffin (most locations always have the muffin in stock, and vegan options are marked with a little carrot icon). It was uninspired but sufficient for its purpose: a super-quick, reliably vegan option I could grab on the go. * If I hadn’t been traveling alone, I would have been more excited about the coffeeshops. But as a solo traveler who’s heard a few too many stories about unprepared tourists getting knocked on their butts by the strong strains of, ahem, coffee in Amsterdam, I didn’t want to risk it! Enjoyed your ” Vegan in Amsterdam”Kelly. You make every thing sound so good and interesting. Good job!